Prize Redemption - Interact Event Productions - Corporate Event Planning at Wholesale Prices! During the duration of the event, participants will compete in various interactive attractions throughout your event to earn Gold, Silver, & Bronze Coins redeemable for prizes at our Prize Redemption Booth. 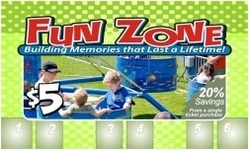 Prize Redemption Booths vary in size based on the event, attendee attendance and other factors. These punchcards will be used at this event to buy items and services like: rides, food, beverages, sport booths, activities and etc. Cash is not accepted at any of our attractions, only punchcards. 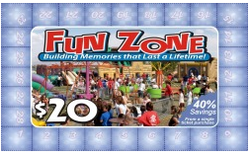 Cash is only accepted at the Ticket Booth for purchase of punchcards. The punchcards will be used like credit cards for all who attend. 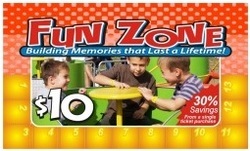 Customers / Attendees purchase purchase punch cards to use at each of the attractions. 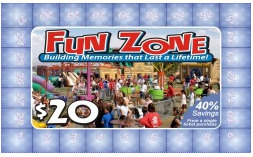 Each attraction you rent from us comes with a custom sign that has the value of each ride printed on it.